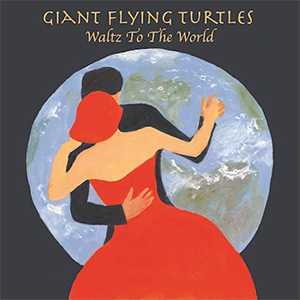 Part of Brooklyn’s indie scene, Giant Flying Turtles have, in a short amount of time, already carved out an impressive niche for themselves. Their second and latest album, Waltz to the World, is a strangely jazzy affair that combines various elements of both prog and left-of-center pop in a catchy yet artistic way slightly similar in vein to XTC. Influenced by Sting and The Police, the band’s sound has that broad worldly quality wherein bits and pieces of different culture’s music are blended together into something fuller and more anthemic. A perfect example of this is the album opener, “No Turning Back.” It has an infectious, blossoming sound that grows and folds in on itself as the song progresses, while never loosing sight of the band’s jazzy, prog-ish origins. The band has a tendency to become just another faceless jazz band with more traditional fare like “The Devil and Me.” It’s only when they branch out of their comfort zone with more daring songs like “One of a Kind” that they create something powerfully original. Although at times uneven, the album has more than it’s fair share of truly inspired flashes, and Waltz to the World is out September 23rd.